Car sales (excluding imported ones) in Pakistan grew at a five-year (FY11-15) compound annual growth rate (CAGR) of just 5.3% to 179,953 units. While volumes surged by 31% in fiscal year 2015 (FY15) on the back of the new model of Toyota Corolla, Punjab taxi scheme and an increase in car financing due to 42-year low interest rates in the country also helped, according to Express Tribune newspaper. “We forecast local car sales to grow at 13% in FY16 to reach 203,653 units,” Topline Securities reported on Monday. In addition to car sales, domestic cement sales have also jumped by a phenomenal 16.89% to 4.29 million tons during July and August 2015 from 3.67 million tons shipped in the same period last year. Car sales and construction activity are both believed to be driven by low interest rate financing available from banks and improved security situation across the country. With record low inflation, the State Bank of Pakistan (SBP), the nation's central bank, has cut discount rate to a 42-year low of 6%. After its September meeting, the SBP said the rise in fixed investment financing in the energy generation and distribution, chemicals and services sectors signal possible increase in their productive activity in coming months. “The implementation of infrastructure development and energy projects under the China-Pakistan Economic Corridor (CPEC) will further enhance the improving investment environment. Therefore, there is anticipation of higher economic activity in 2015-16, which is expected to boost credit uptake,” it said. A dramatic decline in terrorist violence in the country since the launch of Pakistan Army's Operation Zarb-e-Azb and a big drop in international oil prices have helped drive economic recovery in the country in recent months. Quoting a recent study, Alam said that the per capita cement consumption in Bangladesh was still low at 107kg, compared to 210kg in India, 265kg in Pakistan, 310kg in Sri Lanka and 570kg in Korea, indicating future growth of Bangladeshi cement consumption. Way to go! May it be sustained. Ahmed: "Way to go! May it be sustained." Cement and steel go together in any construction. What is the figure for steel production? Gibreel: "Cement and steel go together in any construction. What is the figure for steel production?" It's consumption, more than production, that is a measure of construction industry's strength. Any way, Pakistan steelmakers are having a banner year for both revenues and profits. A hike in car sales can be partly attributed to low oil prices. Cement is too little to project whole production industry. PTI: "A hike in car sales can be partly attributed to low oil prices. Cement is too little to project whole production industry." I don't understand why any good news about Pakistan is hard to digest for some of the posters here. The figures I quote in my post are industry figures, not government figures. I am very delighted to comment here, Sir, I don't understand one thing, why is it that inspite of all this, the GDP of Pakistan is not growing with speed? I have checked the latest news and it says that according to World Bank ,the GDP of Pakistan is the slowest in entire South Asia, even countries like Bangladesh,Sri Lanka and Burma have more GDP than Pakistan. As far as I know or remember, GDP(Gross Domestic Product) is the measure of overall goods and services produced in a country, but inspite of this the GDP of Pakistan is slow. Anon: "even countries like Bangladesh,Sri Lanka and Burma have more GDP than Pakistan." That's not correct. Pakistan's GDP of US $ 250 billion is almost 2X Bangladesh's and several times larger than Sri Lanka's or Burma's. Anon: "GDP of Pakistan is slow." Fast or slow is relative and changes over time. But Pakistan's average GDP growth of 5% since 1970 is about the same as India's. Pakistan's economy grew around 7% per year until 2007 and then slowed to less than 4%. Now it's recovering again to to historical average with lower oil prices and inflation and better security situation. our exports are reducing at alarming rate.our gdp growth rate is lowest in south asia.this consumerism does not show progress.it just shows increased purchasing power of tax evading elite. PTI: "our exports are reducing at alarming rate.our gdp growth rate is lowest in south asia.this consumerism does not show progress.it just shows increased purchasing power of tax evading elite." Yes, the exports are down. It indicates lower prices of exports and lower demand due to weakness abroad. Construction industry is a huge employer. 17% rise in cement consumption means more jobs are being created in Pakistan. Car factories working 24X7 means lots of people are working making those cars. It also means there will be more investment in manufacturing and more jobs created. To me, that is progress. How are car factories working 24x7? My cousin textile factory gets power only 6hrs?? This is clearly another lost decade for us. Instead of Benazir & Sharif playing musical chairs, as it was during the 1990s, now we have Zardari & Sharif going through the motions. The result is the same; one lost decade after another. There is no hope for Pakistan with this kind of civilian leadership. Perhaps it would be better to ask the US/UK to come and take over Pakistan and run it properly. Yousuf: "How are car factories working 24x7? My cousin textile factory gets power only 6hrs??" 1. Industrial areas are now exempt from load shedding. 2. Some, like Indus Motors, can generate 90% of their own power off-grid. It seems your cousin's factory is probably not located in a designated industrial estate nor does it have its own captive power plant. ^RH: "Analysts' projection for this year is production of over 200,000 cars, higher than the 180,000 in 2006-7"
No, no. You WROTE: "Local car sales, excluding imported cars, jumped to 54,812 units in the first three months (Jul-Sep) of fiscal year 2016, up 72% from 31,899 units in the same period of last year, according to data released by the Pakistan Automotive Manufacturers Association (PAMA)." The ~180,000 in 2006-07 you to which to refer is for CARS ALONE. When you add JEEPS + PICKUPS, it comes to ~180,000 + 24,000 = 204,000 total for 2006-07. Which is what the "analyst prediction" is for 2016. This is means that it took ONE DECADE for us to simply get back to the production/sales level of 2006-07. If this is not a LOST DECADE, then what is? North India's cement market, which currently accounts for 31 per cent of country's total consumption, is expected to make a recovery only by FY 2017-18 on account of demand revival in the infrastructure sector, according to a report. Historically, North India is a well-balanced market with high capacity utilisation, low fragmentation and little inward dispatch threat from other manufacturing regions. But a large proportion of the cement market is dependent on rural or retail sales, Ambit Capital said in a report. "A confluence of growth impediments - slowdown in rural sales, weak demand for organised housing and elusive infrastructure recovery - have further deteriorated cement demand/pricing in north India. "North India's large share in major infrastructure projects exudes hopes of demand upcycle, but we believe it will take until FY'18 for a meaningful recovery," it added. In 2014-15, North India consumed 79 million tonnes or 31 per cent of India's cement consumption, the report said. "While 2015-16 was mooted to be a recovery year, demand has worsened, as rural sales decline sharply, real estate inventory has hit an all-time high and infrastructure recovery remains elusive with weak government tendering," it said. Increasing prominence of regional manufacturers in a market with limited logistic challenges (largely roads) has led to price wars. Now prices in north India are at a 35 per cent discount to south India, it added. Regional players accounted for 51 per cent capacity share in 2014-15 as against 45 per cent in 2006-07. North India is facing growth challenges, on account of infrastructure recovery remaining elusive and rural demand deteriorating significantly in the last one year due to poor rainfall, low subsidies, wage growth and paltry MSP hikes. Besides, real estate business is facing liquidity constraints due to government's clamp-down on black money, the report said. It has projected that North India will be a key beneficiary of the infrastructure ramp up in India, given a majority share in large infrastructure projects (roads, Delhi Mumbai Industrial Corridor, etc). "However, a strong and sustained volume growth will take till 2017-18 as retail demand will recover with a few quarters lag to infra demand," the report said. Regional manufacturers with scale and cost efficiencies will benefit the most in an infra-led cement demand recovery, it added. Pan-India players trade at rich valuations, run earnings downgrade risks and do not have the best cost efficiency to meaningfully improve RoCEs, as volumes might grow but chances of a sharp pricing recovery are scanty, it said. The country is enjoying a tailwind created by lower crude oil prices and growing remittances from overseas Pakistanis. It is also beginning to reap the fruits of the government's efforts to reduce subsidies and increase tax revenues in cooperation with the International Monetary Fund. Macroeconomic indicators, including the budget deficit and inflation, have improved significantly. Terrorist attacks and organized crime have fallen off sharply thanks to persistent efforts by the military and security forces, drawing foreign companies back to the country. The government has set an ambitious goal of achieving 5.5% economic growth in the current fiscal year, which runs through June 2016, and 7% growth the following year. It has laid out a road map for improving underdeveloped infrastructure and supporting the energy sector, including expanding the power grid. Insufficient tax revenues, however, mean only half of the projects meant to be underway have been implemented so far. On the Arabian Sea coast is Karachi, the country's commercial capital. It is not hard to spot signs here that foreign companies are returning. Every day, young people and families flock to Dolmen Mall Clifton, a large waterfront commercial complex that houses famous overseas fashion brands, U.S. fast-food restaurants and other retail outlets. Shiny new Toyota Corollas are not an uncommon sight along the city's major boulevards. In April, Yamaha Motor resumed production in Pakistan after a seven-year hiatus. "European carmakers are ready to start operating in Pakistan," said Ghulam Murtaza Khan Jatoi, minister for industries and production. "Volkswagen is making contact with the government." A steel-processing center for Marubeni-Itochu Steel, under construction on the outskirts of Karachi, will soon be operational. In January, German chemical giant BASF opened a new office in Lahore, the capital of Punjab Province. Coca-Cola, the U.S. beverage group, said it will make additional investments in factories and other facilities in Pakistan. Power supply conditions are also gradually improving. "The government's economic policy is considerably better today than during the previous administration, when we didn't have any bright prospects. Public order has also been appreciably restored," said Shabir, 50, who runs a household goods store in the northern Pakistani city of Rawalpindi. "Pakistan can now receive assistance from both the U.S. and China. It is an unprecedented favorable condition," said an executive at a major foreign bank. Now that it is enjoying some forward momentum, the country is in a prime position to carry out structural reform. There is no disputing that Pakistan, with its population of about 190 million and more than 30 million middle-class citizens, is a major South Asian power. But whether it can finally claim the status of "emerging country" depends on the course it follows over the next several years. The upcoming collaboration for the China Pakistan Economic Corridor (CPEC) will certainly bring fruitful results for Islamabad and Beijing, GEODIS (China), Director of Marketing and Sales Frank Zeng said on Wednesday. Zeng, who is responsible for sales and marketing of industrial power projects of GEODIS, one of the world’s largest freight management companies, highlighted the significance of logistics in power projects in Pakistan – a burgeoning avenue within the growing industry. Zeng, along with other panelists, presented valuable insights on strategic, tactical and operational logistics’ planning during an interactive discussion, which was organised by Pakistan’s end-to-end (e2e) Supply Chain Management Pvt. Limited. “With the focus on energy and transportation networks, the CPEC will strengthen and enhance Pakistan and China’s bilateral trade with cardinal regard to the upcoming $1.8 billion Thar coal-based project, the 1 gigawatt solar power park and various other renewable energy projects,” said Zeng, who was also the keynote speaker. With the government going all out to tackle the alarming energy crisis in the country, and several power generation projects scheduled to come online in both the public and the private sector in the coming years, logistics management will play a critical role in ensuring targeted timelines, according to panelists. Reduction in interest rates has caused increase in car financing in the country to 25% as compared to 70% in 2003-07 and 5% in 2008-12. According to experts, it may not reach to levels that were seen 10-years back because of relatively stringent rules and regulations of banks now but it is expected car financing can reach 40-50% of cars sold. Besides locally assembled Japanese cars, used and imported cars are also sold in Pakistan. On an average, local assembled cars make up 75%, while used imported cars are 25% of total sales. Imports of used vehicles have declined by 52% to 23,484 units in FY14. To recall, government relaxed age limit of used imported cars from three to five years in Feb 2011 and amnesty scheme for smuggled cars was also introduced in April 2012. This decision caused a huge influx of used imported vehicles in the local market which affected local sales in FY13 and FY14. The imported figure reveals that major imports of used vehicles were in the category of up to 1000cc (26,525 units in FY13 versus 16,193 units in FY14). However, after observing significant decline in the sales of local assemblers, Govt. reversed its decision of age limit from five to three years in Dec 2012. Currently, import of used cars is declining due to reduced age limit and increased duties/taxes. This is providing much needed support to the volumetric growth of local auto assemblers particularly to PSMC as major imports were in the category of below 1000cc. According to data, car sales in March 2015 reached a record of 21,900 units, as Pak Suzuki sold 13,000 units (up 117% YoY), Indus Motor 5,500 units (up 36% YoY) and Honda Atlas Cars 2,400 units (up 22% YoY). Pakistan has one of the lowest car per thousand of 11 cars providing room for growth with clear signs of economic recovery. Pakistan car sales grew at 5-year (FY10-14) CAGR of 6.6% to 136,888 units. It is estimated that sales of car assemblers will grow at 3-year (FY15-17) CAGR of 10% despite influx of imported used cars (approx. 40,000 cars per annum). During 9MFY15, car sales are likely to grow 23% YoY to 123,542 units primarily due to the new model of Corolla and Taxi scheme delivery from Feb 2015. INDU is expected to post a significant volumetric growth of 50% followed by PSMC with growth of 20% during this period. Sooner or later savings rate has to go up otherwise economy cannot grow to absorb millions of Pakistanis. Cement use is good to see but increase in manufacture besides textiles has to happen on a large scale. Stock market going up doesn't always turn into GDP growth because it may also mean companies are or will be profitable or expenses are low etc. That is why KSE goes up but economy doesn't reflect that. Sikandar: "That is why KSE goes up but economy doesn't reflect that." Some of the fastest growing consumer driven sectors of Pakistan's economy are not even counted in official GDP figures. Savings rate for a developing country is very important. If it is high it allows higher and consistent consumption in the coming years = higher GDP growth that is sustained. If you look at China their GDP growth doesn't fall below 5 or 6%. You should talk about that more because current consumption level is temporary because of low savings rate means less investment in future. Higher savings rate also means sustained and deferred consumption which is better for Pakistan economy. Pakistan takes a giant step forward and made lucrative offers to foreign and Pakistani investors to build several Special Economic Zones, or SEZs including banks, industries and businesses. The bonanza is to ensure a fast track building of China-Pakistan Economic Zone (CPEC) - stretching from the shores of the Sea of Japan to Iran, and down south from the UAE to Central Asian Republics. The up-tick in the Pakistani economy on the back of two years of pro-business Prime Minister Nawaz Sharif's government, and the continued strength of the Chinese economy - which holds vast foreign investment funds and policy to spread out - to build a big new business zone. The new, and strong, resolve to go ahead with the project was the highlight of recent contacts between President Xi Jinping and Sharif. "In view of the large number of potential investors, particularly from UAE-Saudi Arabia-Middle East as well as US and EU, and the interest they have shown, the government has laid down 'The eligibility criteria.' Out of the applicants, the government will pick up financially the strongest, most innovative, and the state-of-art corporations to grant land and other key facilities," a minister told this writer. Nearly half a dozen ministers, heading ministries of finance to planning, petroleum to industries to commerce and electricity, are tasked by Sharif with speeding up the CPEC and the SEZs' projects. "The Chinese are making the initial investment of $46 billion in the CPEC project. It includes an investment of $33 billion in energy alone so that the new projects, as well as the existing ones, and the country at large faces no energy shortage. But, the overall investment will be much larger, as the projects move ahead, production pattern expands, and their input requirements get bigger and bigger. A big push is also expected from the private Chinese corporations and the banks," Ahsan Iqbal, minister for planning told this scribe. He said Pakistan and China will establish a joint investment and industrial cooperation working group to establish industrial zones and SEZs under China Pakistan Economic Corridor. "It will identify the location to establish SEZs, industrial zones and industrial parks under CPEC." Major General (retired) Dr Zahir Shah has been named as its project director.Commerce Minister Khurrum Dasgir, at the same time, informed this writer, "within months of the startup of even some of the industrial units, planned to be located in the CPEZ, or the proposed individual SEZ's, we project that our exports outside the country will see a quick jump. We have already made provisions to help these units to manufacture all types of products which we can be exported, and have a big global demand. These products range from processed and 'Halal' food to chemicals. Necessary arrangements are part of our new three-year export strategy policy which will cover the period from 2015 to 2018." "The criteria" comprises 12 conditions for grant of land, related development and construction requirements for the individual SEZ projects to ensure their viability, productivity and financial and business success for the investors and Pakistan. The investor's proposal will be approved on the basis of the following conditions: A special economic zone (SEZ) will have a minimum size of 50 acres of land. On its completion and development, the zone should generate economic activity in terms of exports, employment and other performance indicators at least equal, or more than the total overall capital cost, incurred over a period of five years. On completion, it will provide import substitution and generate direct and indirect exports. The mobile phone operators in the country have added 2.22 million 3G/4G users during last month, taking the total count of mobile broadband users to 18.04 million. A month back (August), the total number of users, who opted 3G and 4G services, being provided by four operators was 15.76 million, the data issued by Pakistan Telecommunication Authority (PTA) showed. As per details, 3G and 4G users grew 14.43 % month-on-month during September 2015 i.e. highest in past six months. The experts on Monday said the growth in mobile broadband subscriptions is due to increased usage of portable mobile broadband devices including MiFi and Wingle. Mobilink added most number of 3G users with 878,107 new mobile broadband customers that it acquired during the reported month. Ufone stood second in terms of adding most 3G users as it grabbed 637,131 new 3G users during September 2015. Telenor acquired 393,969 new 3G users during the month while Zong converted 316,908 of its customers on to 3G network. Zong, at the end of September 2015, crossed 200,000 mark for its 4G users. Warid had some 156,827 4G users at the end of reported duration. As per the latest auto sales statistics published by Pakistan Automotive Manufacturers Association, tractor sales have started to show signs of respite with 54 per cent monthly rise in its sales to 3,096 units. However, most of the recovery was seen in MTL sales which improved 75 per cent to 2,320 tractors while AGTL showed modest growth of 710 tractors. However, 1QFY16 tractor sales remained at 6,745 units, 28 percent lower than the SPLY. According to data, Heavy Commercial Vehicles (HCVs) sales fell by 8 per cent MoM, mainly due to 54 per cent lower Master sales to 38 vehicles and 58 percent less GHNL sales to 30 units. On the flip side, volumes of GHNI and Hino jumped by 33 percent and 6 percent to 133 and 232 units, respectively. Locally assembled car sales have dipped to 18,424 units in Sep’15 compared to 20,479 units in Aug’15. Experts attributed the 10 percent MoM fall to the reduced number of working days due to Eid holidays. Further, auto sales also start to fall in the first half of a fiscal year, as most of the buyers prefer to buy newer model. During Sep’15, PSMC sales fell by 12 percent MoM to 11,389 vehicles, mainly because of sharp decline in Ravi (-23 percent to 2,859 units) and Bolan (-10 percent to 3,487 units) sales. Similarly, INDU sales slowed down by 10 percent, where Corolla sales decelerated by 6 percent to 4,672 units while Hilux sales declined by 49 percent to 258 units. On the other side, HCAR sales remained stable at 2,001 cars in Sep’15 compared to 2,002 cars last month. Similarly, in 1QFY16, car sales have speeded up by 72 percent to the record highest level of 54,812 units, thanks to growing middle class, rising income levels and lower interest rates. During the quarter, Punjab taxi scheme doubled PSMC sales to 33,770 while new Corolla model brought 50 percent jump to the INDU sales to 14,767 cars. Government plans to expand, modernise and diversify sector. Car sales in Pakistan are surging and will get a further boost as the country launches its new Auto Policy 2015-18, which will help it to expand production significantly. Car sales overshot all records and surged to 151,134 units in FY-15, ended on June 30, from 118,102 units in FY-14, Pakistan Automotive Manufacturers Association (PAMA) said. To top it all, the car sales spree was another record breaking 44,372 units during July-September - the first quarter of FY-16, PAMA said his weekend. It was a record 60.59 per cent higher as compared to the like quarter of FY-15 when the sale was 27,630 units. The credit for this big boost in Q1 of FY-16 goes to Toyota Corolla which alone sold 13,512 units up from 8,546 units in Q1 FY-15. In the longer term perspective, the government has been working on a comprehensive plan to expand, modernise and diversify the production plan for the entire range of auto production. Khawaja Mohammad Asif, Minister for Water and Power, headed the Cabinet's Auto Policy Committee, which took two years to finalise the policy. The committee consulted all the stake holders, including the existing manufacturers, the potential new entrants, car sales groups, and importers of used cars on behalf of the millions of overseas Pakistanis. Thousands of used cars are annually imported by these Pakistanis as the government-permitted personal baggage for use of their families or for sale. Key changes have been incorporated in the new Auto Policy. It now lays down: "If the existing players invest in green field production, they will be offered incentives at par witt the new entrants." It will also push the present assemblers to modernise, expand and start production of latest model cars, incorporating new technological innovations. The existing and the new producers will be treated equally in terms of incentives, and provision of bank credit and infrastructure facilities. Alongside the improved, pro-car policies incentives incorporated in the new policy, auto sales are going up, driving the industry to move ahead. But Honda Civic is facing stiff competition from Toyota Corolla's newly launched model. Honda Civic sale was down to 7,806 units in FY-15 from 9,933 in FY-14. The Industry, market and the financial analysts, going forward, are upbeat about the surge in car production and sales. Topline Securities analyst Muhammad Tahir Saeed said: "Local car assemblers registered an excellent year on year growth of 31 per cent in FY-15 versus just one per cent in FY-14, and a compound annual growth rate (CAGR) of 5.3 per cent during the last five years - FY-11-15." Tahir attributes the higher sales of cars, and of jeeps and light commercial vehicles, to "rising consumer sector dynamics and an increase in car financing due to 42-year low interest rates in the country. Imports of use cars are still hovering around 25,000 to 30,0000 units a year. The imports make around 15 per cent of car sales market in Pakistan." Tahir and other analysts project "a 13 per cent growth during the current FY-16. The healthy growth in the auto sector reflects increase in the per capita income, improved farmer economics and the overall recovery of the economy." The current foreign currency and trade market situation will also spur auto sector in Pakistan. The growth in production and sales in Pakistan will be helped by weak Japanese Yen against the greenback. "It will positively impact the auto sector profitability," said Tahir. Who will gain, what? Suzuki is projected to be the biggest gainer in FY-16. A Suzuki spokesman estimates "a growth of 24 per cent to 122,617 units in FY-16." Pakistan’s Gross Domestic Product (GDP) growth will accelerate to 4.5 in the current fiscal year and to 4.8 percent in FY2016/17, supported by strong services growth and a slight improvement in the industry sector, says World Bank’s newreport, “Pakistan Development Update”, launched today at the Quaid-i-Azam University in Islamabad. The report discusses the important improvements of the external sector in Pakistan over the past few years. The foreign exchange reserves have increased from precariously low levels to appropriate level given the size of Pakistan’s imports. The current account deficit narrowed to US$2.6 billion in FY2014/15 compared to US$3.1 billion in the previous year, a result of record high remittances in the order of US$18.7 billion. External financial inflows continued strong, although lower than in the previous year. As a result, the balance of payments was positive for the second year in a row. Several factors are contributing to low investment levels. Constrained fiscal space limits the government’s ability to make the necessary complementary public investments. A weak investment climate also affects private investment negatively. Another reason for the very low investment levels has to do with the low domestic savings rate in Pakistan at below 10 percent of GDP, which compares unfavorably with an average of around 25 percent in South Asia. Limited access to financial markets, high dependency ratio and low returns on financial instruments all contribute to this low rate of savings. This low saving-low investment trap has reduced Pakistan’s growth potential. The report also discusses the importance of increasing efforts to attract more Foreign Direct Investment from the current low levels of 0.3 percent of GDP, by improving the overall business climate and address regulatory weaknesses at the sectoral level that may be affecting the country’s ability to attract investment. The government is implementing a number of reforms to improve the country’s competitiveness. These include efforts to revive the privatization process, which will increase efficiency in management and improve service delivery, to improve access to and the quality of electricity, to promote financial inclusion and to simplify the trade regime and make it more transparent. Pakistan kept its benchmark interest rate unchanged to support the rupee, which is among Asia’s worst performing currencies this quarter. The State Bank of Pakistan kept the target policy rate at 6 percent, Governor Ashraf Wathra said in a statement in Karachi on Saturday. The move was predicted by 21 of 22 economists in a Bloomberg survey, with one seeing a cut to 5.5 percent. “Headline inflation is expected to reverse its declining momentum,” according to the bank’s e-mailed statement. Average inflation will still remain below the target of 6 percent for the year ending June 30, with a subdued outlook for prices for oil and other major commodities, according to the statement. A weaker rupee risks exposing weaknesses masked by Pakistan’s record foreign-exchange reserves, leaving the nation vulnerable to a balance of payments crisis. The currency has tumbled about 1 percent this quarter, extending the year’s loss to 5 percent. Even so, it’s overvalued by as much as 20 percent, the International Monetary Fund said on Nov. 6. Prime Minister Nawaz Sharif needs to gradually start paying back the IMF for a $6.6 billion loan taken in 2013 to avert a balance of payments crisis. The increasingly strong USD and China's currency devaluation in August have resulted in substantial FX losses for a large number of countries in Asia. However, the extremely high level of growth and future potential in Asia can offset this risk in certain cases. As the Fed may increase interest rates soon, investment in Asia should be a strategic approach of investing in countries with high growth and a strong performing currency. This article presents Vietnam, Pakistan, India, and the Philippines as superior options for investors. Overseas Pakistanis sent remittances amounting to $8 billion in the first five months of 2015-16, which translates into a year-on-year increase of 7.6%, according to data released by the State Bank of Pakistan (SBP) on Thursday. Remittances amounted to a little less than $7.5 billion in the same months of the preceding fiscal year. They amounted to almost $1.6 billion in November alone, which is 3.3% higher than the remittances received in the preceding month, SBP data shows. Pakistanis based in foreign countries sent home $18.4 billion in 2014-15, which translated into a year-on-year increase of 16.5%. Inflows from Saudi Arabia were the largest source of remittances in July-November. They amounted to nearly $2.4 billion in the five months, up 11.2% from the corresponding period of the last year. Remittances received in July-November from the United Arab Emirates (UAE) increased 12.3% to almost $1.8 billion on a year-on-year basis. Inflows from the UAE had registered the largest increase (26.1%) from any major remittance-sending country in 2014-15, SBP data shows. In the last five months of the current fiscal year, remittances from Dubai have surged 45.8% year-on-year. But the figure for overall inflows from the UAE so far has remained subdued because of a 26% annual decline in remittances from Abu Dhabi over the same period. Remittances from the United States and the United Kingdom remained $1.1 billion and $1 billion, respectively, in July-November. The year-on-year change in remittances from the US and the UK has been -1.5% and 4.4%, respectively. Remittances from Gulf Cooperation Council (GCC) countries, excluding Saudi Arabia and the UAE, clocked up at $960.5 million in July-November, which is 11.8% higher than the remittances received from these countries in the same months of the preceding fiscal year. Pak Suzuki Motor Company (PSMC), the country’s largest carmaker, is planning to introduce two fresh variants in the local market, besides setting up a manufacturing plant for spare parts at a total investment of $430 million. Under the new auto policy – which has been pending for quite some time – the Japanese company will look to add to its existing fleet as it looks to tap a growing market. However, an official close to the development said the investment was contingent on the government extending a tax rebate similar to that being offered to new entrants in the proposed auto policy. According to details received here on Tuesday, PSMC will introduce a smaller car in the 660cc engine category, while also introducing a 1,600cc compact SUV. The two new variants will take up around $110 million of the total investment. The remaining amount will go in setting up the manufacturing plant for spare parts. Details revealed that the global head of the Suzuki company shared the investment plan with the federal minister for industries in Islamabad. PSMC has the largest share in the country’s car market dominated by three players. Local auto sales amounted to 93,570 units in the first five months of the ongoing fiscal year, up 66% compared to the same period last fiscal year. PSMC’s share in the five-month sales stood at 58,098 units, owed largely to the Punjab government’s taxi scheme. The government has been working on finalising the auto policy for some time. It is looking to attract investment, besides offering incentives to existing and new players. The ruling PML-N is also reportedly keen on bringing a German manufacturer in the Pakistani market. While the industries ministry had forwarded the auto policy draft to the Economic Coordination Committee, the decision was deferred pending further consultation. Kinji Saito, the global head of the Suzuki Motor Company, called on Federal Minister Ghulam Murtaza Khan Jatoi in Islamabad on Tuesday. Details revealed that Kinji informed Jatoi that the company was looking to introduce the two variants, but was hoping for a tax rebate similar to the one that could be offered to new entrants in the new auto policy. It was further said that the price of the 660cc variant would be close to that of Suzuki Mehran’s. Jatoi, however, said its price needed to be less than that of Mehran. It was also mentioned that Mehran and Cultus variants would be discontinued in the next five years, but are likely to be replaced with fresh models. Jatoi, in a statement released after the meeting, welcomed the company’s plans, saying that Pakistan needed fuel efficient, eco-friendly and cheaper cars to cater to the market. The minister said that PSMC’s share in the Pakistani market was significant, but emphasised that the company needed to bring its prices down. “Pakistan is a big market for the auto industry, therefore special feature like safety measures, fuel economy, environment friendly and affordable prices range are particular needs of our country,” the minister said. Jatoi also assured the Suzuki’s Global Head that protection would be extended to all companies operating in Pakistan in the upcoming Auto Development Policy. According to the latest figures from the IMF, Pakistan GDP reached $270 Billion mark in 2015, up from $246 Billion in 2014, an increase of $24 Billion. Pakistan's per capita nominal GDP for 2015 i $1,427.085, up from $1,325.790 in 2014. Pakistan per capita PPP GDP is $4,902 for 2015, up from $4,749 in 2014. 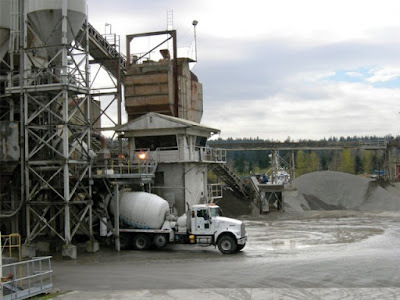 Cement dispatches in the first seven months (Jul 2015 to Jan 2016) of the current fiscal 2015-16 increased by 6.38% to 21.3 million tons compared to 20.022 million tons during the same period of last fiscal, according to latest data released by the All Pakistan Cement Manufacturers Association (APCMA). This positive overall growth is attributed to the robust increase in domestic dispatches during this period. Local dispatches increased by 15.57% to 17.9 million tons from 15.5 million tons in the period under review. On the contrary, exports declined to 3.4 million tons from July 2015 to January 2016 against 4.5 million tons from July 2014 to January 2015, down 24.98%. Factories located in the north of the country dispatched 14.7 million tons in local markets from Jul 15 to Jan 16 against 12.9 million tons during the same period of last fiscal year, depicting a growth of 14.12%. South-based factories registered a higher growth of 23% in domestic dispatches from July 15 to Jan 16 as their local sales recorded in this period were 3.12 million tons against 2.53 million tons during the same period last year. In exports, north-based mills registered a decline of 22.3% as exports were restricted to 2.2 million tons in first seven months of this fiscal against 2.782 million tons during July 14 to Jan 15. South-based factories also suffered a drop in exports during the first seven months of current fiscal year by 29.2% to 1.243 million tons from 1.756 million tons in corresponding period of last fiscal year. The industry dispatched 3.085 million tons of cement in the month of January 2016 compared with 2.898 million tons during January 2015, a growth of 6.47%. Again this was mainly attributed to healthy domestic sales. Local dispatches during January 2016 were 2.69 million tons against 2.419 million tons during January 2015 showing growth of 11.54%. Export dispatches during January 2016 dropped to 386,562 tons against 478,000 tons during January 2015 showing decline of 19.19%. Economic planners are not giving due attention to the rapidly declining cement exports, according to APCMA press release. Pakistan's auto industry is enjoying a boom. All leading brands such as Suzuki, Toyota and Honda have reported high profits. The biggest car producer - Suzuki - shot down the industry's production record growth of 31 per cent by upping its own output by 54 per cent in 2015. Suzuki maintained its leadership among the country's Big 3. The sale of cars manufactured and assembled in Pakistan climbed to 179,953 units in 2015 from 136,888 units in 2014, the Ministry of Industries said. What is pushing this car buying and production spree? The yen stays weak against the greenback, helping car assemblers to buy imported spare parts for cheap prices. Imported spares account for around 75 per cent of the equipment which goes into assembling cars. Commercial banks' interest rates are now the lowest in 42 years, making car financing cheapest in decade. New car models are attracting buyers as Pakistanis enjoy a higher purchasing power. "The latest growth in the automobile sector confirms a rising per capita income in Pakistan, improved economics of the auto sector and overall recovery of the economy," said Tahir Saeed, a financial market researcher. There is big scope of more investment inflows to expand production capacity as competition among car manufacturers increases. Auto is perhaps the only industry which is doing well at a time when others - ranging from textiles to farm products - are hit hard by stagnating exports. Reduced foreign demand, difficulties related to the international oil price crash and energy shortages are key factors hitting other industries. "The auto industry must now focus on enlarging output of its cars and export more units to countries in its neighbourhood. It should also tap new markets in Central Asia," Minister for Commerce Khurrm Dastgir said. Suzuki has unveiled its operational and financial results for 2015. The company is jointly owned by Pakistan Automobile Corporation (Paco) and Suzuki Motor Corporation of Japan (SMC). SMC owns 73 per cent of the joint venture. Paco said: "In January to September 2015, Suzuki tripled its pre-tax profit to Rs6.33 billion as compared to Rs2.18 billion in the like period of the previous year." Toyota cars assembled by Indus Motors is moving up the ladder fast. Its report said: "Toyota sold 57,000 car in 2015 - a record in the company's history. We have exceeded production capacity which is usually 54,800 units a year." The start of mega development schemes and power projects under the China-Pakistan Economic Corridor (CPEC) will boost the annual demand for steel products by more than 30% to 6 million tons from 4 million tons, said an industry representative. Pakistan Steel Re-Rolling Mills Association (PSRMA) Vice Chairman Akhtar Saeed said that 475 steel making units (large and small size) were operating in the country and their annual production was around 4 million tons. The large units’ production share was around 1.2 million tons. Saeed said that more incentives were needed to attract new investment to the steel industry in the country. “The government should come up with a new comprehensive and targeted policy for the important sector of steel and they should have a detailed consultation with PSRMA. “As a result of the increasing demand, new steel units would be set up. Thus, more job opportunities would be created and the government would get more taxes. Lack of adequate transportation infrastructure, higher inflation and poor economy made the low-powered vehicles apex priority of Pakistanis as two-wheeler production increased by 10% to 19, 12,944 units in 2015. "Lower oil prices and improved business environment has provided a much needed boost to motorcycle industry in the outgoing year as production went up significantly due to rising demand," said Association of Pakistan Motorcycle Assemblers (APMA) Chairman Mohammad Sabir Shaikh. He said that the government has to end the cartelisation of Japanese car and motorcycle assemblers in order to flourish the local industry otherwise the industry would remain on sluggish trajectory in coming decades as well. He urged the government to abolish imports regime and duty structure for various motorcycles parts, as the duty on imported parts should be the same at 25 % custom duty instead of existing five different structures. Shaikh said the industry has enough capability to cater to the rising demand of two-wheelers by producing more than 4 million motorcycles per year. However, he added that the government's apathetic attitude towards this dynamic sector has put the industry on a slow track, which has restricted production to only 2 million per annum. "About half of the parts of motorcycles are being made in Pakistan and half of them are imported from different countries while the local industry is capable to make full production if the government patronises the sector," Sheikh said, adding that the domestic motorcycle industry now completely dominates the local market and not even a single motorcycle has been imported since 2007-08. Detailed assessment of Pakistan Bureau of Statistics (PBS) latest data reveals that the motorcycle production including locally made Japanese brand and Chinese made imported motorcycles' brand stood at 1,912,944 units in the 2015, registering 10% growth over the same period of last year to 1,743,039 units. In December 2015, total 156,415 motorcycles were produced in the country, registering 17% growth over the production of 134,230 motorcycles in December 2014. Recently, Atlas Honda Limited has announced an investment of $100 million in the expansion of its motorcycle operations in Pakistan. The first motorcycle produced from the new line will arrive in the market by the beginning of October 2016. The expansion will lead to the generation of 1,800 direct jobs and 5,000 jobs at associated companies and parts manufacturers. Shaikh told Daily Times that around 4 million of motorcycles are sold illegally in Pakistan due to which the national kitty is being deprived of huge revenue in terms of taxation. "Due to this lack of concern by law enforcement agencies, the national kitty is continuously missing huge revenue in terms of taxes and duties as many local motorcycles assemblers do not show sale of unregistered motorcycles in tax documents," he added. The motorcycle production in the country is being run by about 100 motorcycle assemblers, including one dozen cottage manufactures, which produce less than 1,000 units. With the economy growing at its fastest pace in eight years, the local currency stable against the dollar and interest rates at their lowest in 42 years, Pakistani officials believe the country is once again on the radar of investors seeking to tap into a market of nearly 200 million people. Officials are touting a new auto policy, skewed in favor of new entrants, that includes offering foreign car manufacturers lower duties as an incentive to set up plants in Pakistan or revive shuttered ones. "We expect that there will be one or two foreign investors coming into Pakistan," said Miftah Ismail, chairman of Pakistan's Board of Investment, who has been talking to car makers about setting up assembly plants for the local market. Ismail told Reuters he had held talks with Japan's Nissan (7201.T) and alliance partner Renault (RENA.PA) for "some time", and last month met Fiat (FCHA.MI) executives in Italy for the first time. Previous discussions also involved Germany's Volkswagen. "I hope some people will bite," he said. A source close to Renault said Pakistan was under consideration for new production investment, along with other potential locations, but added that discussions were at a very early stage. In an e-mailed statement, the company said it had "no news to announce at this time". Nissan chief spokesman Jonathan Adashek said: "Pakistan is certainly a market of interest for us at present", but added no final decision had been made. Owing to the lower interest rates in the banking sector, Pakistan’s local car assemblers Tuesday showed 29 per cent year-on-year growth in July-April 2015-16. The local vehicle sales stood at 184,099 units versus 142,814 units during the same period last year. An analyst of a brokerage house said that the main reason behind the rising sales of cars is auto financing as well as overall improvement in the country’s economic situation. The interest rates are at a 42-year low and below six per cent. The banks, investment companies and others are providing auto financing to use their excess liquidity. Pak Suzuki Motor Company (PSMC) sales increased by 41 per cent year on year to 109,628 units during the last 10 months of 2015-16 primarily due to Punjab government’s taxi scheme. Volumes decreased by 18 per cent YoY (1 per cent MoM) in April 2016 (second month after the completion of the Taxi Scheme) to 8,965 units primarily due to completion of Taxi Scheme. Indus Motors (INDU) sold 52,987 units during the last 10 months of 2015-16 versus 45,978 units during the same period of last year. In April 2016, sales fell 6 per cent YoY to 5,483 units. On MoM basis, sales declined 5 per cent due to fewer working days in April 2016 compared to March 2016. It is important to note that delivery time for the new Corolla model is still hovering in the range of 2-4 months depending on the variant. The Honda Company is going to launch its New Honda Civic model, which is expected to hit the market in the 2nd half of this year. Volumes of Honda Civic are expected to dry out in the coming months in anticipation of the new model launch in the 2nd half of 2016. Honda Cars sold 21,293 units in the first 10 months of 2015-16 compared to 18,781 units during the same period of last year. In April 2016, Honda sold 2,751 units, up 16 per cent YoY (flat MoM). 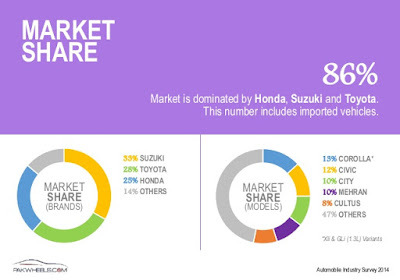 The analyst said that Honda City remained the major contributor in this growth during the said period. Pakistan’s tractor segment posted a decline of 31 per cent YoY during July-April 2015-16 to reach at 26,586 units. This decline is because of the delay in the launch of provincial tractor subsidy scheme of 25,000 to 29,000 per tractor which was announced by Punjab and Sindh governments in the budget for the fiscal year 2015-16. Millat tractors (MTL) and Al-Ghazi tractors (AGTL) both witnessed a decline in their sales volumes during the last ten months as farmers were waiting for the execution of announced subsidy schemes by Punjab and Sindh governments. Tractor manufacturers demanded of the governments to either execute or shelve the announced scheme so that farmers may resume their normal purchasing. MTL sold 15,974 units in July-April 2015-16 compared to 23,426 units during the same period last year. The company’s sales decreased by 29 per cent YoY to 2,440 units in April 2016 (down 4 per cent MoM). During the current fiscal year, AGTL witnessed a decline of 30 per cent YoY in sales to 9,882 units. The company sold 1,935 units in April 2016, up 23 per cent YoY (7 per cent MoM). Farmers seem to have resumed regular purchases due to uncertainty in the subsidy scheme. Trucks and buses segment of Pakistan’s automobile sector has posted an increase of 42 per cent YoY to reach at 5,076 units during the first 10 months of FY16. This surge in demand is because of China-Pakistan Economic Corridor and improving law and order situation in the country, the analyst said. Pakistan's cement industry's profit rose 30 per cent to PKR45.169bn (US$431.6m) in the first nine months of the current fiscal year as there was a surge in sales, supported by soft oil and 11-year low coal prices, according to the Topline Securities Ltd brokerage. In the July-March period of the last fiscal year, the local industry earned PKR34.847bn. The profitability growth was supported by 13 per cent YoY growth in sales as a result of higher local dispatches, firm local pricing, 802 basis points increase in gross margin to 40.9 per cent and 16 per cent decrease in selling and distribution expenses, said Topline Securities analyst Nabeel Khursheed. The brokerage assessed the financial results of 15 cement markers, out of 19 players, representing almost 100 per cent of the industry's market capitalisation. The report said the industry's profit grew 26 per cent to PKR16.303bn in the third quarter (Jan-March) of 2015-16 on the back of 20 per cent increase in local dispatches and rise in gross margins. Rising local volumes, stable local pricing and declining input costs (coal prices near 11-year low and falling power tariff) are likely to support margins of cement manufacturers, Mr Khursheed said. "We downplay any risk of a price war amongst cement manufacturers as the industry is already operating at around 85 per cent of capacity utilisation. If the local industry continues to grow at the same pace, we expect demand to outpace supply in the near future," he added. The brokerage report said local demand was strong because of a rise in housing projects and start of China-Pakistan economic corridor projects. Cement sales increased 9.93 per cent to 28.34Mt YoY for the period July-March 2015/16. Local dispatches rose 18 per cent to 24Mt and cement exports fell 19 per cent to 4.406Mt in period under review. #Pakistan #cement industry continues growth. Per capita consumption to rise from 147kg in 2015 to 250kg in 2020. Pakistan’s cement industry will continue to grow over the next few years due to strong pricing power and contraction in supply and demand gap, a Topline Securities report said on Tuesday. The capacity utilisation of Topline Cement Universe – a sample of cement companies listed on Pakistan Stock Exchange (PSX) – is likely to reach 96% in fiscal year 2018 from 78% in fiscal year 2015. Gross margins of Topline Cement Universe will reach 47% by fiscal year 2020 (which were 34% in fiscal year 2015) while earnings before interest, taxes, depreciation, and amortisation (EBITDA) margins will reach 46% by fiscal year 2020 (34% in fiscal year 2015). Resultantly, Topline Cement Universe’s profitability is expected to grow at 4-year (fiscal year 2017 to fiscal year 2020) Cumulative Annual Growth Rate (CAGR) of 24%. Pakistan’s cement industry has entered into a new paradigm. The turnaround in macroeconomic fundamentals, mega projects under the umbrella of China-Pakistan Economic Corridors (CPEC) and booming private sector spending are accelerating local cement demand. “We believe economic recovery will continue to bolster domestic demand. Based on past trend, we have applied a factor of 2 times to our average real GDP growth forecast of 6% during fiscal year 2017 to fiscal year 2020 in order to arrive at average local cement growth forecast of 12% during the same period,” the report said. 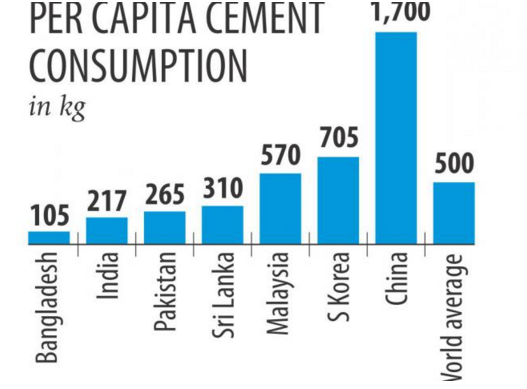 This should take per capita cement consumption of Pakistan from 147kg in fiscal year 2015 to 250kg in fiscal year 2020. The government in budget for fiscal year 2016-2017 has changed the federal excise duty (FED) on cement bags from variable 5% of retail price to fixed Rs50 per kg while duty on imported coal is reduced from 6% to 5%. “Thanks to strong pricing power, we believe that, the net impact of Rs33 per bag will be gradually passed on,” the report added. A significant rise in infrastructure projects in the wake of China-Pakistan Economic Corridor (CPEC) is also expected to accelerate demand for iron, steel and cement. “Imports of both steel scrap and steel products increased by 27.3 per cent and 30.1 per cent, respectively, during July-March FY16,” said the SBP report. “The imports posted extraordinary growth despite imposition of anti-dumping duties for four months on import of cold-rolled coils and sheets from China and Ukraine,” said the report. The country produces six million metric tons of steel per year, as per a report published by the State Bank of Pakistan (SBP). This includes raw products, iron ore and scrap flat products, sheets and plates used in the automotive sector, and long products (steel bars, wire rods, rails, and structures used in infrastructure development, and tubes and pipes). However, per capita steel consumption in Pakistan is very low at 23.5 kilograms against 58.6 kilograms in India, as well as the Asian average of 261.3 kilograms and the global average of 216.9 kilograms, the report added. The entry of the French automobile manufacturer Renault in the Pakistani market is being considered a good omen for the country’s automobile sector. The entry of the world’s 10th largest automobile manufacturer, and the second largest automaker in France, would not only add fuel to the market competition but would also provide some 10,000 job opportunities in direct and indirect jobs for the Pakistanis, informed the Ghandhara Nissan Limited (GNL) to the Pakistan Stock Exchange (PSX). "GNL is proud to join hands with Renault, one of the largest global automobile manufacturers and Al-Futtaim, UAE. The company will produce the vehicles at its existing assembly plant located at Port Qasim,” said Sheharyar Aslam, company secretary at GNL, reported local media. The project will attract investment of around $100 million including approximately 60 percent foreign investment informed the company, calling the new auto policy “a move that will ensure an even playing field to new entrants,” added Aslam. Previously, it was learnt that Renault is set to open its manufacturing plant by 2018, as it was announced by the government on Thursday. However, it remains to be seen how the European automaker would cope in the market dominated by Japanese titans i.e. Suzuki, Toyota and Honda. After the announcement by the Korean and French auto giants to invest in Pakistan’s auto sector, the major incumbent Japanese player Pak Suzuki Motors has unveiled a plan to invest $460 million to set up a second assembly plant in the country. Pak Suzuki Motors Managing Director Hirofumi Nagao called on the Finance Minister Ishaq Dar on Thursday and discussed his company’s plan of future investment in Pakistan. The MD said that his company was ready to invest $460 million in Pakistan to set up a second plant. After completion of formalities, the new project would be completed within a period of two years and may start production by the end of 2018, he informed. The minister asked the Pak Suzuki Motors MD to submit a complete plan with all the details to process the request in accordance with prescribed codal formalities and procedures. He said the government was committed to providing a level playing field to all the prospective investors. The government has implemented a new auto policy from this fiscal year that provided tax incentives up to three years for the new players in the sector. The incentives were not offered to the existing three Japanese players. However they were provided incentives for modernization and expansion. Japanese auto giants are demanding the similar policy incentives for making new investment in the country. The government may provide similar incentives to Japanese auto makers if they make investment in setting up new plants, an informed source said. A week back a big Pakistani conglomerate announced that they planned to assemble autos in the country with the help of Korean auto giant Kia Motors. While a delegation of French company Renault formally informed the Finance minister in Paris that they planned to set up an auto manufacturing plant in Pakistan. The minister said Pakistan has been projected by JETRO as the second best place for investment in the world. He said that the turnaround of Pakistan’s economy, macroeconomic stability, improvement of energy and security situation in the country has provided a conducive atmosphere to foreign direct investment. He said that a number of new entrants have shown keen interest to invest in automobile manufacturing sector as well. The meeting was attended by senior officials of the Ministry of Finance and the members of the delegation of Pak-Suzuki. Renault soon could start producing vehicles in Pakistan, a government official says. The French automaker is negotiating with the government of the Southwest Asia country to build cars in a joint venture with Gandhara Nissan, Renault’s global partner, Miftah Ismail, chairman of Pakistan’s Board of Investment, tells WardsAuto. Renault proposes initially investing $100 million to expand manufacturing capacity at the currently mothballed Ghandhara Nissan Motors plant in Karachi, which has not produced vehicles since 2010. The plant is located near the capital city’s deep-water port terminal, Port Qasim. Ismail says a Renault technical team visited the plant Nov. 3. Renault proposes assembling 16,000 vehicles a year in three shifts at the site and raise annual production capacity to 50,000 per year in two phases. Should the project go ahead, Ismail says, the JV would build both SUVs and sedans at the site, with production starting as early as 2018. A Renault spokesperson confirms the automaker’s interest in Pakistan production to WardsAuto, adding it also is in talks with Al Futtain, an industrial conglomerate based in the United Arab Emirates. The automaker’s application follows a September visit to France by a delegation of Pakistani government and business officials led by Finance Minister Ishaq Dar, who urged Renault and rival automaker PSA Peugeot Citroen to consider investing in Pakistan. Dar discussed the government’s new industrial policy regarding the automobile sector, which includes waiving duties on imported assembly plant equipment for foreign automakers locating in the country. The new policy, in effect since March, envisions doubling yearly production of cars, vans, utility vehicles and light-commercial vehicles to 429,000 units over the next five years. Automakers active in Pakistan in 2015 manufactured 146,024 cars and 82,889 trucks of all types, according to WardsAuto data. Pakistan wants to diversify a car market currently dominated by Toyota, Honda and Suzuki, whose locally assembled cars are sold at relatively high prices but lag behind imported vehicles in terms of quality and specifications, government officials contend. Customers have complained about having to make payments up-front for new vehicles, then wait up to four months for delivery. Consumer activists note quick delivery often carries a 15% surcharge. The Ministry of Industries and Production says only 13 of 1,000 Pakistanis own or operate a car, Southwest Asia’s lowest rate of penetration. But with the economy expanding at its fastest pace in eight years – growth in 2016 could reach 4.7%, according to the World Bank – interest rates at a 42-year low, the Pakistan rupee’s stability against the U.S. dollar and an inflation rate of 5.2% and falling, officials believe their country successfully can attract major industrial investors. South Korean automaker Kia has expressed interest in producing cars within Pakistan, according to Pakistan brokerage firm BIPL Securities. Car sales in Pakistan – limited exclusively to Toyota, Honda and Suzuki – totaled 145,820 in 2015, up 32.9% from prior-year, WardsAuto data shows. Deliveries of 78,427 light trucks – all but 912 of them Suzukis or Toyotas – were up 135.3% year-on-year. UK company, Asian Precious Minerals (APML), is to build a new cement plant in Pakistan, according to local news reports, with an investment of US$400 million. The plant is to be built in the province of Khyber Pakhtunkwha in the northwestern region of Pakistan. The investment was announced at a meeting between APML officials, the Chief Minister of Khyber Pakhtunkwha, Pervez Khattak, and officials from the British High Commission. “We are delighted to be investing in a new cement plant in Khyber Pakhtunkwha,” said Nadim Khan, CEO of APML. “We look forward to constructing a model, state-of-the-art and environmentally friendly cement plant. Khan also praised the provincial government for improving the security situation in Khyber Pakhtunkwha, which borders Pakistan’s tribal region and Afghanistan, as well as its “pro-business stance and good governance policy”. Pakistan’s cement sector is currently booming with utilisation rates at cement plants reaching over 90%, according to the All Pakistan Cement Manufacturers Association. In the six months to the end of 2016, cement shipments in the country grew to 19.896 million t on the back of local demand growth of 11.07%. “Pakistan growth is being driven by the Economic Corridor with China (CPEC),” according to cement industry analysts, IA Cement. When Naeem Khan went into his local automobile dealer in Karachi to replace his five-year-old taxi with a rickshaw, he was not expecting to leave with a brand new air-conditioned car instead. But after getting a financing package that was cheaper than he expected, Mr Khan became one of an increasing number of Pakistanis who have recently bought vehicles they previously only dreamt of owning. The national surge in sales has prompted three global carmakers to commit in the past few months to starting production in Pakistan, potentially doubling the number of foreign carmakers in the country. 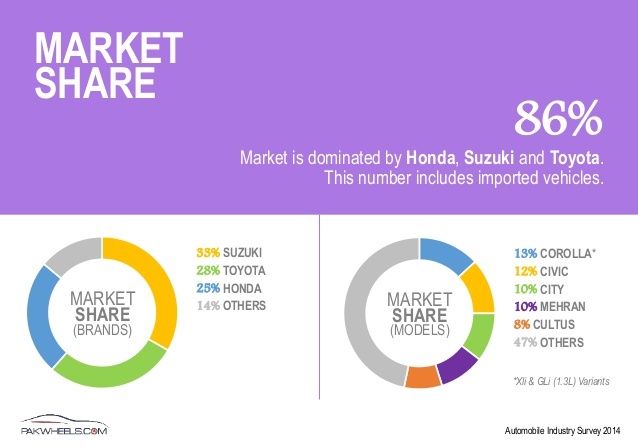 Pakistan’s car market is still small, and dominated by the three Japanese brands that have local manufacturing plants: Toyota, Honda and Suzuki. The trio made all but seven of the country’s domestically manufactured cars in 2015-16, according to the Pakistan Automotive Manufacturers’ Association, though the figures are just a fraction of their total global car sales. In the past, analysts say, manufacturers have been put off by the country’s relative poverty, as well as political instability and concerns about security. But in the past few months, France’s Renault and both Hyundai of South Korea and its affiliate Kia have announced they will soon start assemblies in Pakistan, in partnership with local companies. It marks a return for Kia and Hyundai, which left in the previous decade when their local partner suffered financial problems. The new and returning entrants are being drawn in by several factors. The first is both the scale of the potential market in a country of 200m people, as well as the rate at which it is already growing. In 2012-13, carmakers sold 118,830 cars in Pakistan. By 2015-16, that had risen 52 per cent to 181,145. Analysts say the surge has left Toyota, Honda and Suzuki struggling to meet demand with their customers sometimes forced to wait as long as five months before their cars are delivered. Renault declined to talk about its plans while it is in negotiation with local partners. Part of the reason for the rise in car sales is that Pakistanis are getting richer. Between 2010 and 2015, the amount each person earned per year rose from $4,370 to $5,320 as measured in gross national income per capita at purchasing power parity. That trend is expected to continue, partly helped by China’s plans to invest more than $52bn in Pakistan’s infrastructure under the “One Belt, One Road” project. Hyundai forecasts that, consequently, car sales in Pakistan will hit 300,000 a year by 2020. Just as importantly, say analysts, has been the corresponding fall in interest rates. Since September 2000, the rate at which banks can borrow from the Pakistan central bank has fallen from 13 per cent to 6.25 per cent. Another factor drawing carmakers to Pakistan is that security has begun to improve thanks to a two-year campaign by the army. Mr Khan remembers days when he and other taxi driverswere routinely stopped at gunpoint by armed extortionists. “The streets are now safe and people feel comfortable driving till late at night,” he says. Third, the government has drawn up policies aimed at attracting carmakers, such as cutting the duties applicable to parts shipped from abroad and making it easier to find a site to build a plant. ISLAMABAD, Pakistan – Volkswagen has made significant progress in talks to establish manufacturing operations in this South Asian port city of Karachi, a top government official says. “Volkswagen Commercial Vehicles is in final talks with Premier Systems, the authorized importer of Audi vehicles in the country, to set up a manufacturing/assembly plant for its Amarok and T6 models and Volkswagen,” Tariq Ejaz Chaudhary, CEO of Pakistan’s Engineering Development Board, confirms to WardsAuto. A senior official at Premier Systems adds VW is considering establishing production of Audi luxury vehicles in the country. “Volkswagen Commercial intends to use the same plant Audi intends to build for the assembly of its own vehicles in Karachi,” the official says, adding VW plans to open about 40 dealerships across Pakistan to accommodate rising demand for its Amarok pickup and T6 vans. The possible launch of the three vehicles in Pakistan’s market of 190 million people follows forecasted demand arising from the China-Pakistan Economic Corridor program of development projects backed by the Chinese government. A VW manufacturing presence also would be among the latest results of the business-friendly policies pursued by Prime Minister Nawaz Sharif. The Amarok is a direct competitor to Toyota’s HiLux Revo and the T6 is a multipassenger van. Federal Commerce Minister Khurram Dastgir Khan confirms to WardsAuto that VW “is in talks with government of Pakistan to launch its passenger/commercial plants in Pakistan,” although he doesn’t comment on the status of the negotiations. Another possible motive for VW to enter Pakistan is the scheduled July launch of refineries able to produce high-quality diesel fuel. Other automakers considering production in Pakistan include Hyundai, which may form a joint venture with textiles manufacturer Nishat Mills; Kia, which may partner with Lucky Cement, one of the country’s largest cement makers; and Renault, which is in talks with India’s Ghandhara Nissan Motors to use its Karachi plant for car assembly. Chief Engineer Yoshiki Konishi: #Pakistan is top market for #Toyota #Corolla cars in #Asia and 4th in the world. Remarkable success of Corolla in Pakistan has made Pakistan number 1 in Corolla sales in Asia Pacific and number 4 in the world,” said Yoshiki Konishi, Chief Engineer for Corolla, Toyota Motor Corporation at the 26th IMC Dealers Conference held at a local hotel here recently. The theme of the conference was “Race to Ace”. Dealership CEOs, executives from Toyota Motor Corporation, Toyota Tsusho Corporation, senior management from the House of Habib, dealer management and teams and the IMC management attended the conference. In his video message, Yoshiki Konishi appreciated IMC’s efforts in successfully promoting Toyota in Pakistan for the last 26 years. He added that since its inception 44.1 million Corolla cars have been sold globally. “Technology is changing the entire landscape of business. Big names which fail to change according to the environment soon become part of history and we have to acknowledge the technological change happening in our country,” said Chairman Indus Motor Company (IMC), Ali Habib. “We have gone back to the basics, that is, Toyota Way,” he added. The new facelift model of 11th generation of Corolla was unveiled in the event, which will be available in Pakistan from August. “The most beautiful Corolla is here to excite Pakistani market with new features like Push Start, Smart entry, 16 inch Alloys, 9 inch infotainment, new interior, Vehicle Stability Control etc.” said the Chief Executive Officer, IMC, Ali Asghar Jamali. He said their special emphasis is on ‘best in class’ safety features to standardize Dual SRS Air Bag across all the variants of Toyota Corolla, ISO Fix Seat Anchors, Front seats 3point ELR with Pre-Tensioner and Force Limiter seatbelts in all variants. Sales of locally assembled vehicles, including jeeps and light commercial vehicles, jumped to 19,577 units in July 2017, up 41% compared to 13,932 units in the same month of 2016, according to latest data released by the Pakistan Automotive Manufacturers Association (PAMA). A Topline Securities’ report said the numbers were in line with its estimates. The apparently large difference in monthly sales may be attributed to reduced working days in July 2016 because of Eid holidays, the report said. Sales of Pak Suzuki Motor Company increased 37% year-on-year (YoY) in July 2017 due to strong demand for Wagon-R, up 77%. With the introduction of a new model, sales of Cultus rose 66% YoY while Ravi sales were up 41%, which also supported the company’s growth. Honda outperformed its peers in vehicle sales, posting 113% growth due to successful introduction of a new Civic model and new sports utility vehicle (SUV) BR-V.
Indus Motor sold 4,618 units in July 2017, up 11% YoY. The company’s focus remained on production of higher-margin Fortuner, which recorded a stellar growth of 543%. Moreover, buyers were postponing their purchase of Toyota Corolla, waiting for the face-lift model, which has arrived now. Truck and bus sales of PAMA member companies in July 2017 remained strong, growing 13% YoY. The trend is expected to continue, fuelled by the China-Pakistan Economic Corridor (CPEC) led growth, higher road connectivity, lower financing rates and enforcement of the axle load limit per truck on highways by the National Highway Authority. Two and three-wheel vehicle sales for July 2017 grew strongly by 42% YoY due to rising disposable income of the lower middle class, the report added. Tractor sales continued to exhibit an upward trajectory with sales growing by 125% YoY in July 2017. Lower general sales tax, improved crop yield due to Punjab government’s Kisan Package and continuation of fertiliser subsidy to improve farmers’ purchasing power contributed to the strong tractor sales. Moreover, in the provincial budget for fiscal year 2018, the Sindh government has set aside Rs2 billion in subsidy on tractor purchases by farmers.